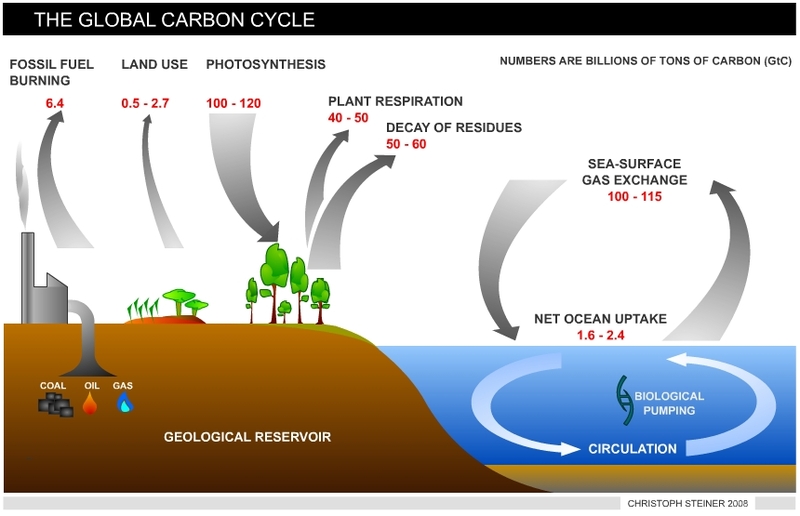 Terrestrial ecosystems and the oceans exchange CO2 rapidly with the atmosphere. The carbon exchange from the lithosphere is very slow, although some CO2 is released by volcanoes. CO2 is removed from the atmosphere through photosynthesis and stored in organic matter. When plants grow they utilize sunlight, CO2 and water (H2O) to synthesize organic matter (photosynthesis) and release oxygen (O2, see equation 1). This organic matter is returned to the atmosphere by decomposition of dead plant tissue or distur-bances, such as fire, in which large amounts of organic matter are oxidized and rapidly transferred into CO2. Terrestrial carbon is primarily stored in forests (5). In undisturbed full-grown forest ecosystems, the turnover time of carbon is on the order of decades and uptake by photosynthesis and release by decay is balanced.